When the world is thinking beyond jet planes the idea of having fun with bicycle may not be too alluring. But that's exactly what Ajay Kumar Nanda, founder, 22bikes did, he could rekindle the love of biking in the hearts of many. And the beauty lies in the fact that he did it quite effortlessly as he chose to turn his passion into his profession. A passionate cyclist, Ajay has travelled to various cities like Rourkela,Sambalpur, Baleswar in state by bicycle. He has achieved the commendable feat of travelling from Bhubaneswar to Bhutan (1302 Km) along with 6 teammates, in October 2015. With a management degree and 6 years experience in the retail industry, he stepped into the shoes of an entrepreneur by opening a boutique for cycle- his childhood love. The bright mind ventured in at the right time as he shares his vision with the current generation who are warming up to the idea of congestion-free environment and are eager to be proud participants of non-motorized road traffic. Obviously, it's beyond a traditional cycle shop housing variety of models to rent or sale; it is a thought provoking get together station whether young minds gather to savor some good coffee and rejuvenate with some good reads. The vibrant ambiance embedded with a huge collection of bikes, accessories and related components reflects the fact that it is an outcome of some possessed mind who is crazy about cycling. 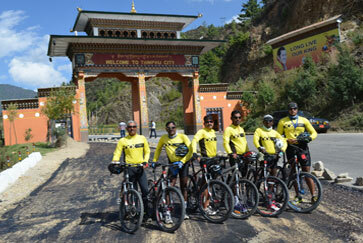 What's cheer-worthy is dedication to extend flawless service which is testimony to his love for cycling. Similarly,his intention to contribute to the society cannot go unnoticed as he donated five cycles to SriSri Anand Ashram and was responsible for organizing a blood donation camp on the foundation day. Seeing his commitment & endurance, his yearning to open few more such boutiques across the nation is surely expected not to be a distant dream. Pathbreaking attitude: Ajay finds a place in the 'Pathbreaker' column due to his relentless efforts to develop a cycling community in Bhubaneswar. 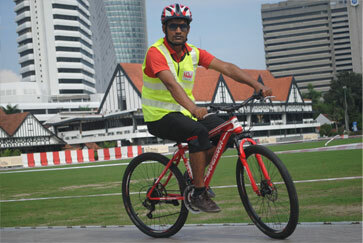 From organizing various cycling events, training camps for cyclists to enhancing cycling skill, educating kids about cycling at schools, developing and guiding lady cyclists, raising voice for cycling track in city or advocating cycling as a fitness activity, he has left no stone unturned. By encouraging people to opt cycling to cover less than 10km distances, he aims to reduce the carbon footprints in the Smart City Bhubaneswar.